Viola loves her room and spends so much time in there. Playing with her monster dolls or crafting, always with the TV buzzing in the background. It looks so cozy. Newer Post Hello! Older Post Jenny – will this do as my everyday life picture tour? Jättemysigt rum! Man blir lite avis. Oh, I love it. Too pink for me, even as a little girl, but it has such a lovely dreamy happy feel. She is one lucky little girl. 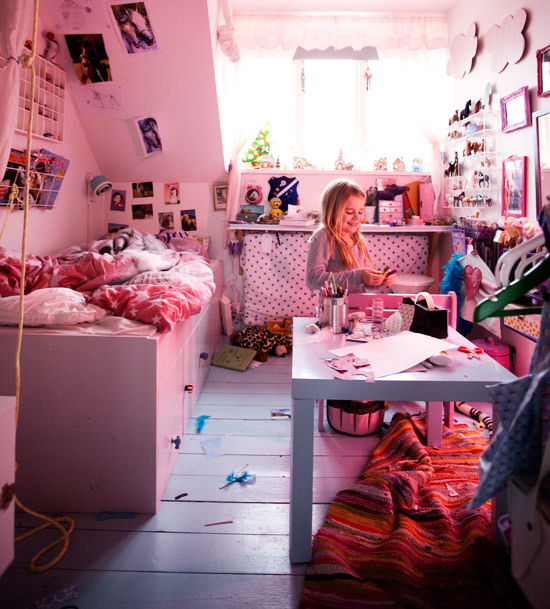 A fantastic girl with a fantastic room! I love this site! Last may my boyfriend and I bought a new home. So far we haven’t been able to furniture and style it. Mostly because I was laid off my previous job and my current one only pays me half of what used to earn. And because I want to make the most if it and we only agreed to buy things we really really love. Like our table, it oval, with bauhaus like chairs. It was expensive for costarican standards but totally worth it. Well my point on commenting in this specific post is that one of the rooms in the house is almost like this one. 2.45 m + 3 m and I haven’t been able to think how to start there. The walls’s height is about 2.6m at this moment we are using it for my pc and all the books and movies. I thought about making a walking closet of it but I guess it will be a nice guest bedroom. We do not have kids yet so the possibilities are endless. This site has helped me understanding space! Violas rum är så litet så vi fick bygga en säng till henne. Vi utgick från insatserna till Ikeas expedit – serie, och byggde sängen i mdf.